This high performance bluetooth speaker features 4.0 technology that provides an outstanding connection range of up to 33 feet with your Iphone, iPad, Android, Windows Smartphones, Tablets, and any that enables bluetooth connection. 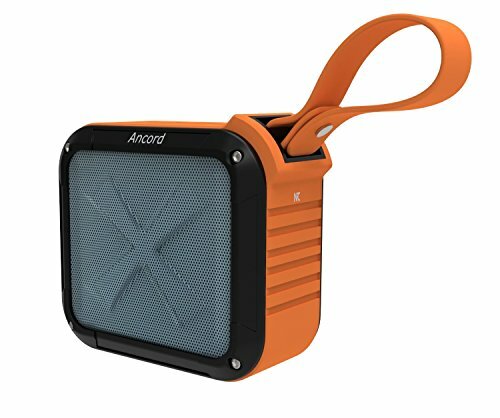 The Ancord Bluetooth Speaker comes with a high capacity battery that allows for up to 12 hours of playback on a single charge. This makes it an excellent choice for people on the go. It has flexible music streaming connectivity options that let you stream your favorite audio tracks into it from a distance while you are out hiking, climbing, canoeing, in the beach or doing other outdoor activities. In addition, it's IPX6 certified, which means prevents the bluetooth speaker from water splash, light rain, mud and even dust. Listen to your favorite music wherever you go with The Ancord Bluetooth Speaker. This speaker features a built-in digital FM radio tuner with auto-scan presets for easy programming. You will never miss again listening your favorite stations while on the go. What is your risk? Nothing. Short press POWER BUTTON exchange Bluetooth and FM mode, Long Press "+" or "-" to search for next or last station. Long Press the "->" to search for the station automatically. And press the "+" to stop it when you get to the station you need. BUILT-IN FM DIGITAL RADIO! : We help you keep up with the newest, cutting-edge Bluetooth technology - but without forgetting good old FM radio! Long Press "+" or "-" to search for next or last station. Long Press the "->" to search for the station automatically. And press the "+" to stop it when you get to the station you need. 100% SATISFACTION GUARANTEED!. We are confident that you will love your outdoor speaker , but if you are not satisfied, our products are always backed by 100% Money Back No Question Asked Guaranteed! If you have any questions about this product by Ancord, contact us by completing and submitting the form below. If you are looking for a specif part number, please include it with your message.